Students who want to explore their interests in British culture, geography, history and politics will find a home in our British Studies program. 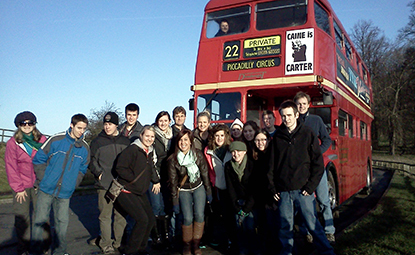 You'll explore UK society past and present to foster intercultural and global understanding. You’ll most easily qualify for our British Studies minor with credits earned during a semesterlong Education Abroad program at Alnwick Castle in England, but short-term programs, such as one in Wales, and courses at partnering British universities also are available. Students who live at the castle study in state-of-the-art classrooms, help with community events and enjoy field trips to sites such as Edinburgh, Durham and London. Multi-disciplinary program offers in-depth understanding of a country and society that has played and continues to play an important role regionally and globally. Courses taught by British and American faculty in the United Kingdom and at St. Cloud State University dedicated to student learning in program themes. Formal academic recognition for student investment in education abroad programming. International education and experiences that are highly valued by employers. The only British Studies minor in Minnesota. More than 30 years experience in offering successful programming in British Studies. Often cited by program alumni as the best experience of their time in college. The Alnwick program is the only U.S. Education Abroad Program housed in a 13th-century castle.